St Thomas Developments (well known for the luxurious residential One St Thomas and commercial use 7 St Thomas buildings) has announced its latest project, titled "88", which will create a community of its own utilizing a full city block on Queen Street East, bounded by Queen, Shuter, Mutual and Dalhousie Streets. This multi-tower mixed-use development integrates residential living with vibrant street retail, restaurants, food stores and a boutique hotel. 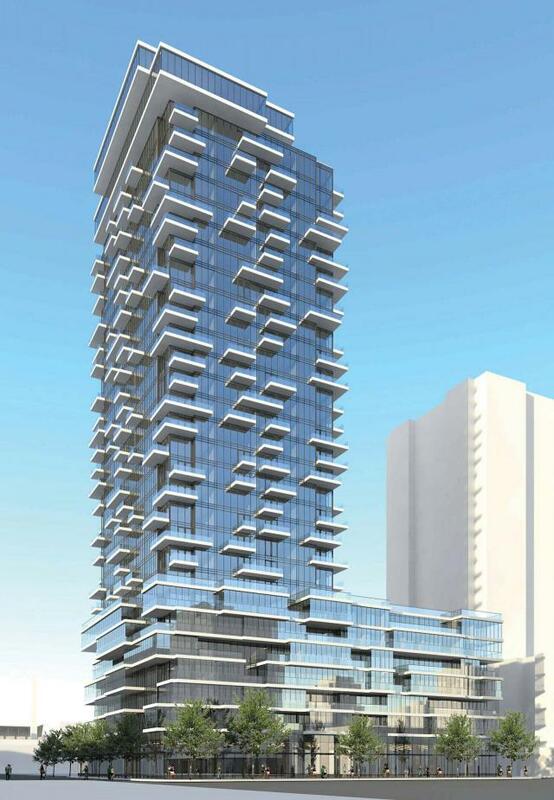 This project is sure to have a positive effect on the up-and-coming Queen East neighborhood. 88 North is the first phase of the development. The building will boast 27 storeys, housing 407 studio, one-bedroom, and two-bedroom suites ranging in size from 380 to 701 square feet. Suites will start at $230,000.00. Conceived as a stack of glass boxes, the building’s 7-storey podium will feature beautiful two-storey lofts. 88 North’s base will be dominated by retail space with retractable glazed storefront partitions that will open up in good weather to seamlessly integrate indoor and outdoor spaces. Patios will animate the street and the park. From the mews to the amenities, every aspect of 88 is designed to create a sense of community by providing common grounds to bring residents together – they won’t even need to cross a street. As greenspace is such a crucial part of any community, pedestrian footpaths and European-style laneways will lead through 88, culminating in an intimate park akin to iconic urban spaces such as Paley Park in New York. This will be a true place of gathering that will be publicly accessible and surrounded by food stores, cafes and restaurants. Created to serve as an extension of residents’ living spaces, 88’s amenities were designed to act as an urban resort for residents. These will include an exercise room, party room and media room. The centerpiece of the outdoor features, located at the roof of the podium, is a swimming pool surrounded by a landscaped deck for lounging and meeting with neighbours – all designed by Claude Cormier. St Thomas has partnered with Page + Steele/IBI Group Architects, interior designer Cecconi Simone, and landscape designer Claude Cormier & Associates to create a truly unique community where residents have convenient access to everything they need. Developer: St Thomas Developments Inc.
Marketing and press: MarketVision Real Estate, L.A. Inc.